BRC member, Janetha Jones; Scholarship Recipient, Riley Murray; Scholarship Recipient Sydney McCoy; Scholarship Recipient, Katie Hyde; Scholarship Recipient, Jocelyn Harnold. BRC member, Fallon Moody; BRC member, Tanya Justice; parents, Bill & Sharon Murray; parent, Kimberly McCoy; New Beginnings Scholarship Recipient, Sandra Smith; parents, Doug & Susie Hyde; parent, Chi-li-ma Harnold; BRC member Taylor Connor; BRC member, Heather Hernandez; 2016-2017 FBJSL President, Laura Taylor. 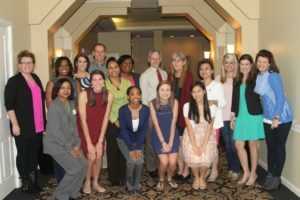 Fort Bend Junior Service League (FBJSL) established a scholarship program in 2008 for local teens and women who desire to further their education. FBJSL awards up to four Volunteer Scholarships in the amount of $1,000 each to female high school seniors who have demonstrated outstanding achievement in volunteerism and community service. Additionally, the $2,000 New Beginnings Scholarship is an award established to provide assistance to one Fort Bend County woman who wishes to return to school to improve her career opportunities by furthering her education. In 2017, FBJSL is pleased to present, Katie Hyde, Jocelyn Harnold, Riley Murray and Sydney McCoy each a Volunteer Scholarship in the amount of $1,000 for their outstanding volunteer efforts in Fort Bend County. Also, FBJSL is pleased to present Sandra Smith as the New Beginnings Scholarship in the amount of $2000 for her dedication and desire to further her education. The recipients were chosen from a highly qualified pool of applicants from public, private and parochial schools throughout Fort Bend County. The winners stood out among the other candidates as leaders in their schools as well as in their various volunteer efforts. Katie Hyde attends Logos Preparatory Academy and plans to attend Texas A&M majoring in Animal Science with a minor in Wildlife and Fisheries Sciences and an Equine Certification. She has a passion for animals, particularly endangered animals and conservation. She has traveled to Washington DC to learn about wildlife conservation and advocacy as part of the Girl Scouts Cheetah Conservation trip. Not surprisingly, much of her volunteer work centers around animals having volunteered with the Houston Zoo, a local veterinary hospital, and the Houston Rodeo, as well as competing in local rodeos. Technology for her accomplishments in computer science. She plans to attend UT Austin as a Biology major. Sydney McCoy participated in the 8 month long Youth in Philanthropy program sponsored by The George Foundation where students have an opportunity to work with local non-profits and then, at the end of the program, assess the agencies for award dollars from the Foundation. One of Sydney’s volunteer projects was awareness of autism for students and their parents. A member of the National Honor Society, the Science National Honor Society and the National Spanish Honor Society at Ridge Point High School, her academic achievement has earned her an AP Scholar Award. She plans to pursue a degree in Engineering. Riley Murray currently serves as captain of the girls varsity soccer team and has competed on the varsity swim team for the past 3 years. She is currently president of the National Honor Society at George Ranch High School. It is her love of swimming and helping others overcome challenges that leads her to volunteer as a swim coach and a camp counselor for children with Muscular Dystrophy. She is an entrepreneur with her business, Riley’s Swim Lessons, where she offers 30-minute lessons during the months of April to September to local children. She plans to attend Texas A&M and major in Nursing. This year’s New Beginnings Recipient, Sandra Smith, has had a more than 20 year professional career in Software and User Support Analysis and Help Desk Support Specialist, most recently with Schlumberger. Like many other women, she married and devoted herself to her family, including 3 children, while putting her educational goals on hold. She has faced personal challenges of loss and illness. She has volunteered and served in numerous leadership roles including a Cub Scout leader, March of Dimes volunteer, and also a diabetes and cancer walk awareness participant. She is a devoted woman of faith and desires to complete her degree so that she can continue to provide for and be an inspiration to her family and friends. Sandra envisions herself as a college graduate with a degree in Business Information Technology. The Fort Bend Junior Service League is a 501(c)(3) non-profit organization of women committed to promoting volunteerism, to developing the potential of women and to improving the Fort Bend County community through the effective action and leadership of trained volunteers.